No. 18, Song Shou Rd. 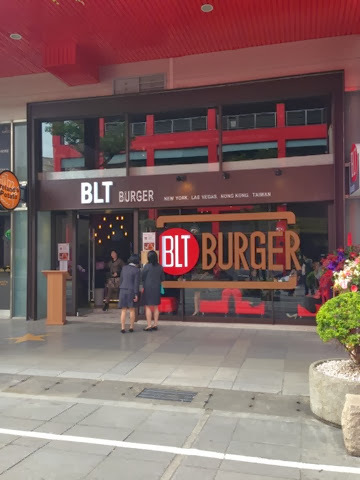 BLT Burger has made its way to Taipei with a trendy outlet at Xinyi Vieshow Cinemas, right next to the also newly opened Krispy Kreme and Mazendo. BLT Burger is part of the BLT food empire, with branches in Hong Kong, New York, Las Vegas I had a chance to check it out last November during its soft opening. The inside is spacious, perfect for group lunches or booths for couples, or a private room in the back for parties. 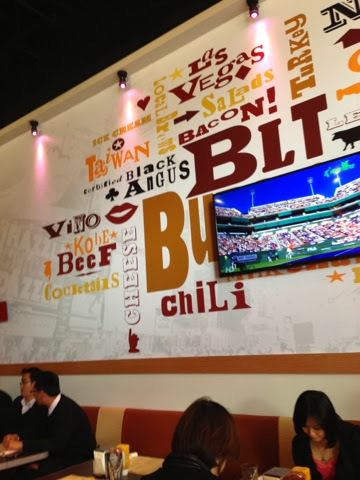 While there are quite a few places nearby to grab a burger- the Diner, Gordon Biersch, Chili's- there hasn't been a dedicated burger spot in this area until now (unless you count Burger King or McDonalds. Lol). Does anyone else vaguely remember when there was another burger place in this same area back when it was Warner Village? Ruby Tuesdays? Haha, haven't thought about that place in ages, until this moment. The menu features lots of different types of burgers, including Wagyu, Tex-Mex, Buffalo Chicken or even a Salmon burger. 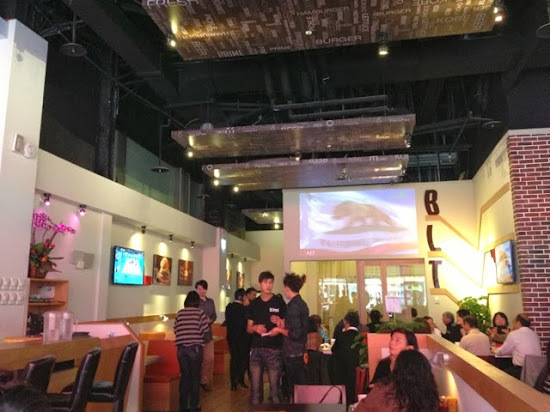 BLT Taipei's menu is missing a few things from what's offered at the Vegas branch (Lamb Tandoori, Wagyu truffle, Pimento cheese), instead it's more similar to the Hong Kong BLT. Sides include onion rings or fries (which were incredibly small portions the day we went) or starters include bbq nachos, wings, mozzarella sticks, chili bowl or savory waffle fries bites. I eyed the milkshakes, and there are also spiked milkshakes and cocktails/beer. 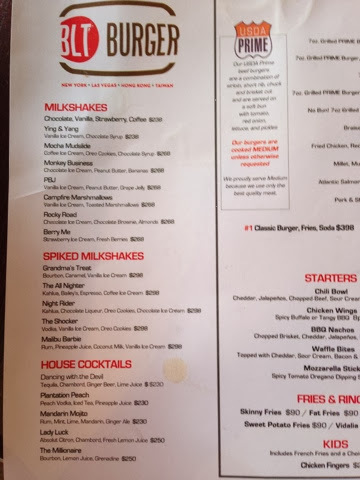 I really wanted to try a milkshake, but I wasn't about to pay NT$238-300 (US$7-9) for one! 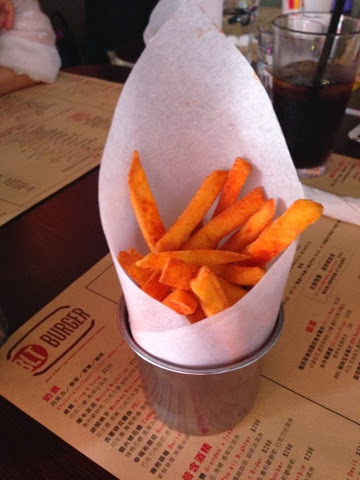 Burgers don't automatically come with fries, unless you order the lunch set. Everyone in our party missed the small type for the lunch set underneath the burgers except for one person who order the classic burger set (NT$398), so be sure to look for that and order it since the fries come on the plate and looked like more than what was given ala carte (and you can switch out the regular fries for waffle fries etc). 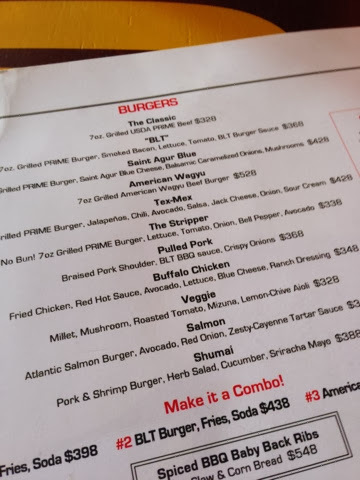 So that being said the burgers are pretty expensive, paying about NT$400 for just a burger especially if you want to order one of the more creative ones. My favorite burger, taste wise, was the signature BLT Burger (NT$368) though I wished the bacon was crispy and there was less sauce. It was kind of a mess to eat, but we cut it into fourths to share. Came with a tiny coleslaw that no one ate. 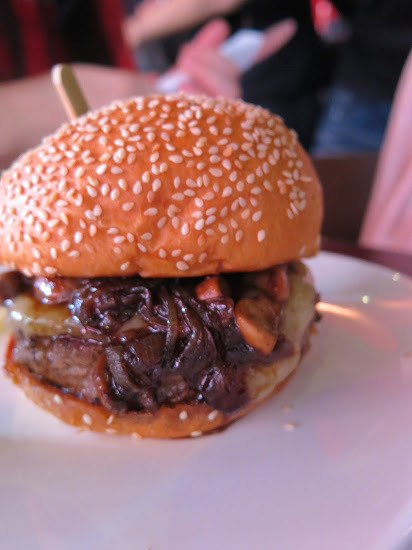 My next favorite was the St. Agur Blue burger (NT$428) although the balsamic grilled onions dominated the flavor and the melted cheese did not taste like blue cheese at all. 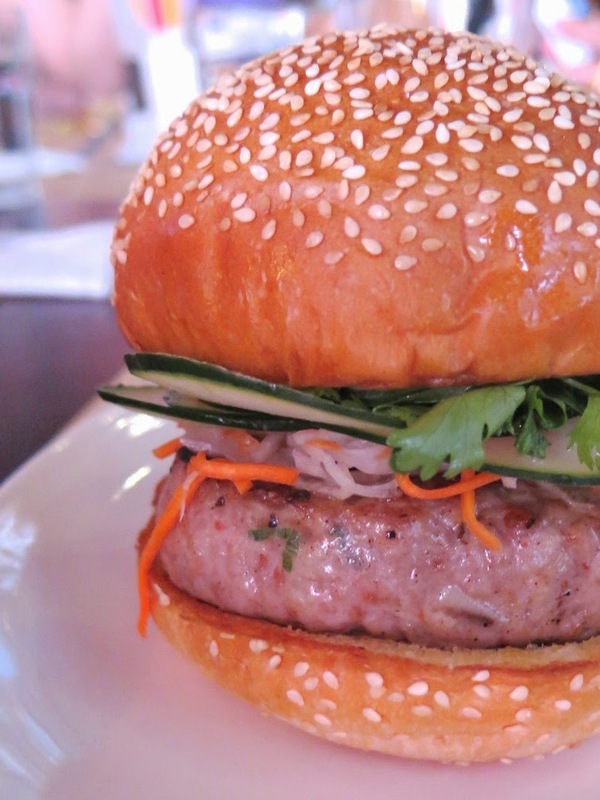 One friend was adventurous by trying the Shumai Burger (NT$388) which had ground shrimp and pork patty, but actually tasted Vietnamese (banh mi) -inspired with the finely julienned pickled carrots, radish, cilantro and cucumbers. I also wasn't crazy about the Pulled Pork (NT$368)- it was slightly greasy and the strips of pork were too long to eat in neat bites. 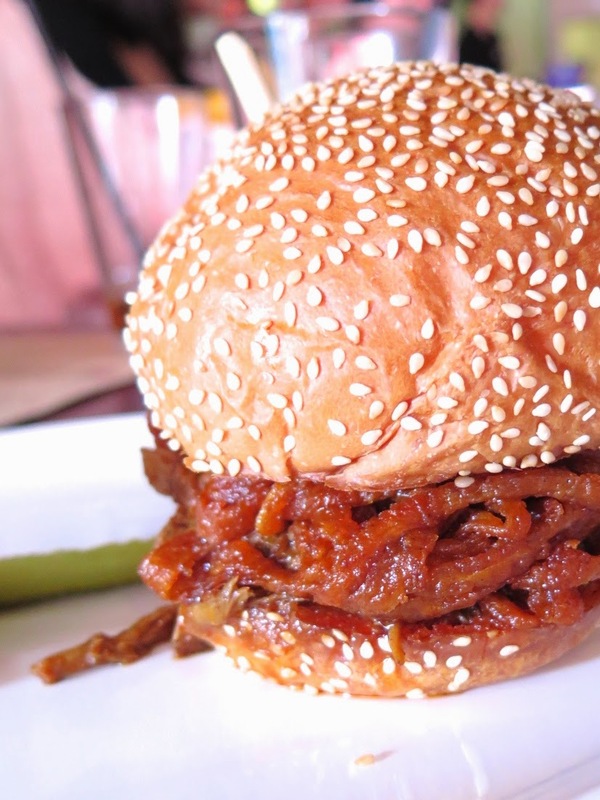 It didn't taste like the usual bbq pulled pork- you could find better versions at Gordon Biersch, Burger and Co. or Ed's Diner. I regretted ordering this and was glad my friends shared their burgers with me. 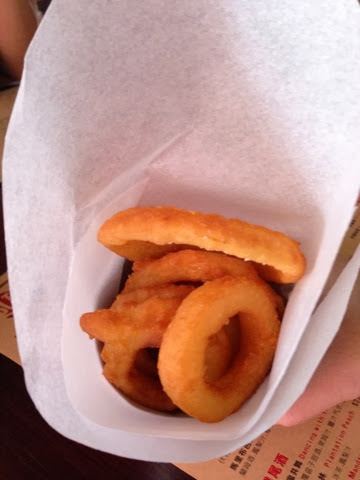 Again, let me say how disappointing the size of the ala carte sides were- sweet potato fries (NT$90) and onion rings (NT$120). Also probably wouldn't order the salad or nachos again. 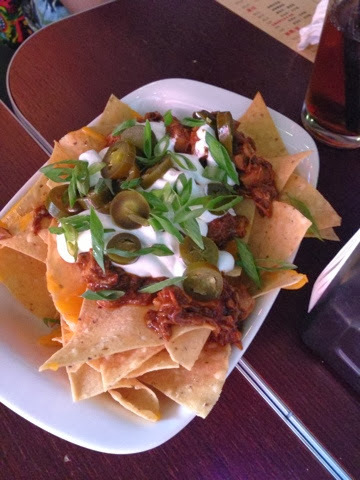 Wasn't enough cheese on the nachos (NT$268) and chips were surprisingly a bit stale. More cheese please!! 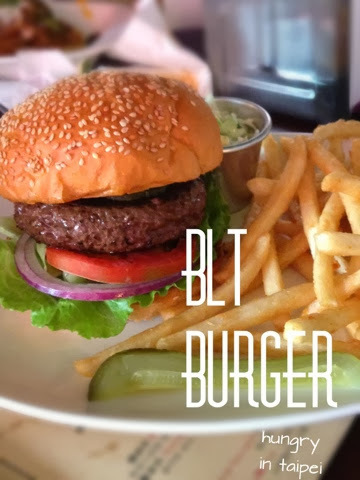 So while BLT Burger seemed so enticing when I first spied the menu, I haven't been back since my first visit as there are so many burger options in town that are just as good (if not better) for more affordable prices. At those prices (and with this review) I'll stick with 1885, which just opened a branch near the Ikea on Nanjing E. Rd. There's also a new place I want to check out on Guangfu N. Rd. near Minsheng, where there was a Good Day that finally failed after trying various concepts. happy 9 years to hungryintaipei!